Caught up to Jimbo from Godspeed this morning around Civic Center on my way into work then saw Frank Chan of the SFBC a few mintues later heading the opposite direction on Polk Street. Caught a little skitch for half a block after that. Made it to work in under 10 minutes. Hate to break a sweat before work, but it felt good. 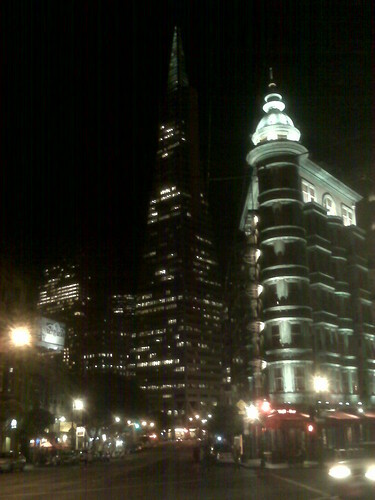 On my way back home, riding down Columbus to BART. These days it is getting dark earlier. Not a fan. Riding home, for whatever reason, felt especially good this evening. Sometimes it's nothing more than a commute, while other times just riding through the city on a bike is enough to make me euphoric.